At Taj Banjara, they offer a distinctive dining experience, one that explores the nuances of the finest Indian and international cuisines, serving traditional and contemporary favourites. Located at the lobby level overlooking the tranquil lake, this 24-hour international eatery is an ideal venue for dining out, business entertainment and family gatherings at any hour of the day or night. The Café offers an elaborate buffet with global cuisines for breakfast, lunch and dinner along with a varied al-a-carte selection. The themed breakfast at the coffee shop is well appreciated amongst our guests. Brunch on Sundays from 1230 hrs. till 1600 hrs. with an exclusive spread is popular amongst the guests. 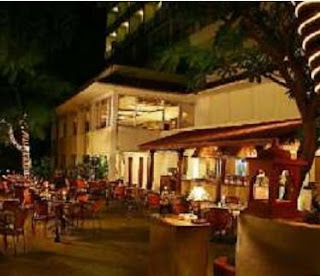 The delightful open air lakeside Indian barbeque restaurant serves succulent kebabs and tandoori cuisine for dinner. This restaurant is known for its kebab platters and has recently featured in the top 50 dining options in the country. At Kebab-E-Bahar, guests can look forward to the famous Hyderabadi Kebabs along with an exciting variety of the North West Frontier Kebabs, Specialities like Shikampuri Kabab, Pathar ka Gosht and Dal Makhani are all creations of the stalwart Chef Chamanlal. The restaurant offers Oriental cuisine and is known for its Thai preparations. Strings is open for lunch from 1230 hrs. till 1500 hrs. and dinner from 1930 hrs. till 2345 hrs. Underdeck is known for its Long Island Iced Teas and shooters and offers the entertainment of a four-piece International Band.